Up in the Bungay area recently, I revisited the phenomenal 12 foot tall monster crinkle-crankle on Garden Lane in Worlingham. It's an absolute wonder, sitting there in the midst of a modern estate, an isolated relic. Mr Google suggested it was previously part of the grounds at Worlingham Hall. Their village sign even depicts a long snake-like wall in the background. Hoping to see said sign on Sunday 19th March, it wasn't there! Taken away for spring cleaning, perhaps? 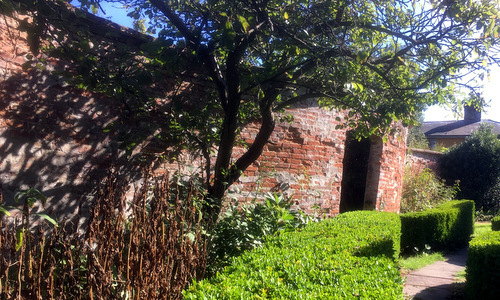 More non-Bing-ing uncovered another Rightmove house where "the garden is enclosed by a crinkle crankle wall." 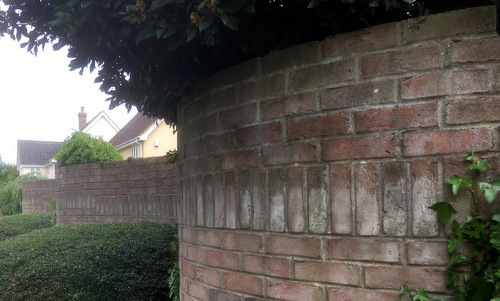 Part of a neighbourhood watch area, a local resident of The Walnuts eyed us with interest as we parked half on the kerb and took snaps of the six-foot wall. 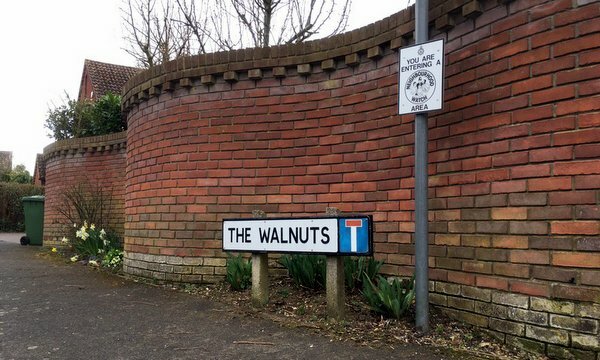 Clearly nowhere near as remarkable as its cousin in Garden Lane, it sprouts a not unattractive coping (like Old Station Road in Halesworth) and featured a colourful bunch of daffs in one of the inner parts. Lengths of about 25 metres and about 10 metres. Two to three metres high with inner pilaster strips, triangulated coping. Starting alongside the driveway, it snakes along the garden taking in an arched opening before making a 90 degree turn left. We didn't have the best weather to fully appreciate it but the flowers still stood out in the drizzle. Thanks enormously to owner Susan for taking time out for me and my Mum to view her L-shaped wonder. 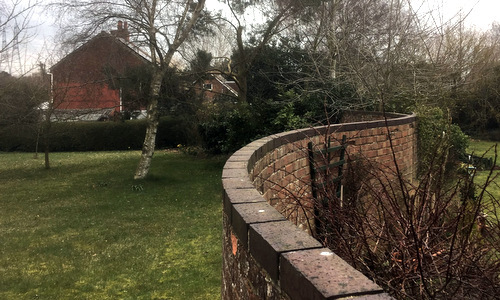 As other easier to access walls have been steadily ticked off, Broke Hall (see its very own Wikipedia entry), with its Repton-designed gardens and views over the Orwell, has remained aloof. Until now. Andy, who's already come up trumps with Boyton, Melton and Debach, scoured some OS maps and identified a path just to the north of the hall. So for the first time since my trip to St Edmund's Road, it's me on my bike. Sure enough, veering off the driveway that leads to a bunch of other nearby properties puts you within view of the infamous serpentine. 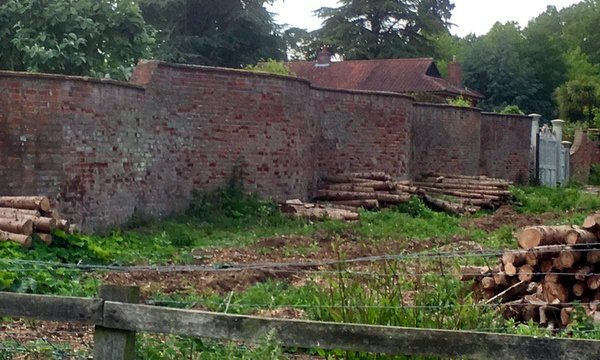 That bird's eye view seems to show a well-tended walled garden. Can't get too close but that distant wavy wall's a good 'un, apparently authentically vintage (house itself is dated 1792) and a decent height to boot. It also drops down rather elegantly to meet an ornate wooden gate and sweeps round a corner to become perfectly straight on its south-east aspect. Must be quite the view from inside that garden. 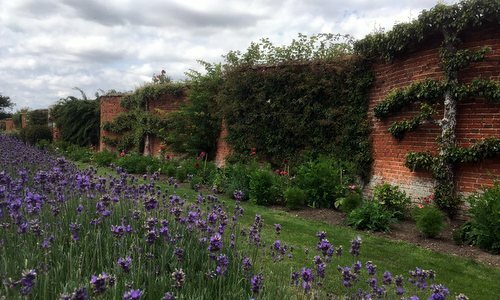 Competing with Easton for the title of best known wobbly wall in Suffolk, the example at Heveningham Hall has proved elusive for the last 18 months. Look up "crinkle-crankle wall" in the book "A Glossary of Garden History" by Michael Symes and he names a single example, this one. Could I sweet talk my way in for a private visit? No, I could not. Could I sneak around the back during the Christmas fair? No, I could not. I was, however, "very welcome to attend next year's Country Fair when the walled garden will be open to the public." So, if this is July 2017, we must be sitting by the tea tent within Capability Brown's walled garden, sipping cold beverages and listening to the hospital band. Over there stands the magnificent 90m serpentine, apparently built in 1796 according to Dr Bettley. 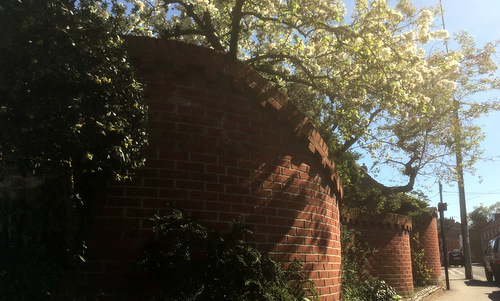 Climbing up those old bricks is the odd espaliered pear tree. Above us, meanwhile, are the RAF Falcons parachute display team. Quintessentially English. Motoring along the B1069 on a bitterly cold March day, Eldest suddenly pointed to our right. Wall! Dedicated professional that I am, we didn't stop since all of us were hungry. On we carried to the splendid Kitchen at Thorpe Ness only to discover that their card system was down: cash only, please. Cue Dad driving solo to a find an ATM in a freezing Aldeburgh. Bellies full, we returned and pulled over to Burch's Close in Knodishall. Attached to the far left house stands a wavy wall around twenty bricks tall, most likely built in the 80s or 90s. Swirly and slimline. Spotter's badge to eagle-eyed Eldest who, lest we forget, wrote the original handwritten list. 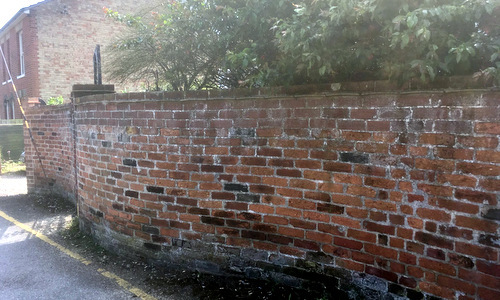 Idly searching on Twitter, I saw that someone had commented about there being six crinkle-crankle walls in Beccles. Hi, I said, I've seen the ones at Hungate Lane, Coney Hill, Puddingmoor, Gaol Lane and Richard Crampton Road. Do you know of any more? Top man that he is, Simon Bond not only responded quickly but with photos of two further examples. And so it happened that after a perfectly lovely coffee and cake at Urban Jungle on the town's outskirts, me and Mama turned right out of Denmark Road into the lengthy Ravensmere. Opposite the Royal Oak we find a fresh sinewy red brick wall, not only crinkling and crankling but varying in height too. Simon's word is his Bond. Feeling absolutely tip-top and walking back to the car, things went horribly Benedict Wong when I lost my balance and became unable to stand up. After much sweating and unpleasantness splayed out along the back of the car, G. drove me to A&E where I was diagnosed with labyrinthitis, an inner ear thing. Yuck. Over a week since I was struck down with Beccles blight at Ravensmere, my loss of balance meant that I still couldn't walk in a straight line. Kind of appropriate when investigating serpentine walls, doncha think? Nonetheless, having a further day off for my birthday, I suggested a return to Beccles. Rather nice lunch at rather nice Twyfords -- love the soda -- then a wavy walk (leaning heaving on G.) along Station Road with an abrupt turn into Fair Close. Behold the second of Simon Bond's suggestions outside Minstead at 53a, a crinkle-crankle with gaps for both a driveway and a gate. Did more of it exist at one time? Still my birthday (hoorah! ), back we headed after a successful ticking-off of Fair Close. Always in search of the road less travelled, we were zigzagging down through the many Elmhams and into a village I'd never previously encounted. Welcome to Rumburgh. Slowing down opposite the village pub, the Rumburgh Buck, G. replayed Eldest's actions in Knodishall. She pointed out of the window. Wall! No idea how the female members of my family see such things at speed but, needless to say, she was right. There, down a side road called The Forge, is a very regular curvy wall. Eighteen horizontal bricks, one vertical then four or five more on top with bushy bushes in the concavities. Makes me wonder just how many more examples there could be out there in the curious county of Suffolk. 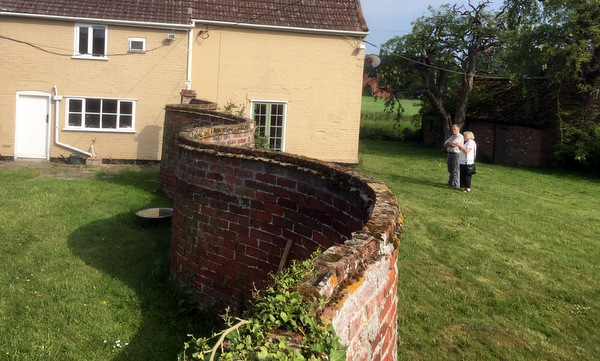 Having used Rightmove to uncover specimens at Hollesley, Theberton and Halesworth, I moved on to (former WBA shirt sponsor) Zoopla and promptly found mention of "a fascinating spine wall built in a serpentine or crinkle-crankle fashion". Thought we'd swing by Bruisyard on Sunday. Could just about see the wall behind the house and would most likely have been happy with that but sat in the driveway was a car. Knocked on the door and met Peter, the perfect host, who promptly escorted me and Ma to view his very own serpentine. This house was the former village store, ran by his parents and then by Peter. Although he's been here on and off since 1947, that wall predates him somewhat and is easily the oldest we've seen since Heveningham. Previously part of a kitchen garden, this is a humdinger with regal curves and random cracks. Those birds, explained Peter, peck away at the lime mortar. When I ventured the other side to take a picture, Mum said she could see me walking back through the assorted holes. Thanks, Peter! TC MP didn't know its exact location, Google was no help, then Andy and me tried and failed to find it. That was that until I thought to contact the artist himself, John Bawtree, "Suffolk landscape and architectural artist". John was most helpful and told me he did the painting in the early 1980s while staying in Sibton at a house named Abbot's Lodge. Over two years later and we're here at last courtesy of current owner Mrs Curtis. Her daughter's standing in for her this sunny Saturday morning to speak to these two idiots with their point-and-shoot phones. 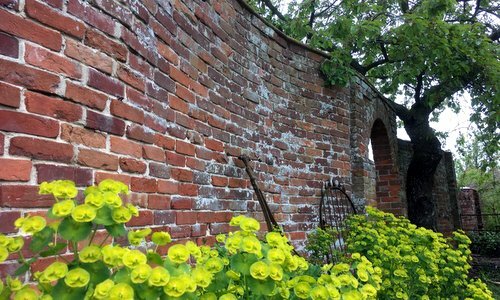 One side of an attractive walled garden, it's a fine weathered example and clearly of an age with a doorway leading to the greenery beyond. Coping stones appear intact and that rough surface begs you to run your hand over it. Thanks to both the artist and the owner for leading us here.